grandfather was an architect who built man SELLER’S PERSPECTIVES 33) 5 SOCIAL MEDIA historic properties in this area, so I always ha MISTAKES REAL ESTATE houses.” A friend suggested that re 48)interest HOWinTO OVERCOME AGENTS MUST AVOID might be a good fit, and Lee decided to give YOUR WORKPLACE Copyright Top Agent That was Magazine a fortunate decision for the many FEARS buyers and sellers who have since been lucky to work with her. 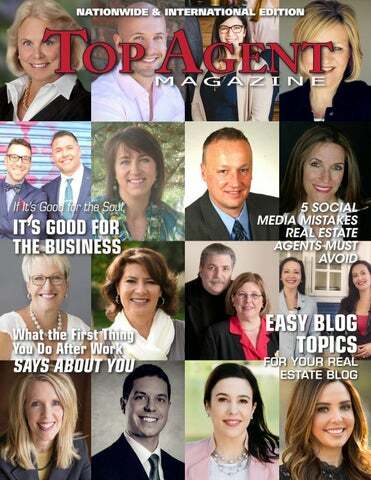 REALTOR Vendors and Real Estate Companies— Get Nationwide & International exposure! Please contact or sales-oriented. We just want to truly help people, and that able to help people through something as big as buy mag@topagentmagazine.com comes across in the way we work with our clients. In turn selling a home.” overcoming. We also work hard to For more information about Bob and Richelle Ward, process as smooth and as effortless as or call 310-734-1440 for please call 203-470-9818 or email wardteam@cbmoves.com To learn more about Tanner Hawryluk, visit tannerhawryluk.com or go to h ad rates and information. Facebook page, email tannerhawryluk@remax.net or call 780-962-8580 www. 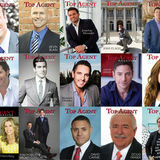 Copyright Top Agent Mag To find out more about Mark Vittardi, 3 visit his website at depiero.com/users/mark-v www. The top-notch level of service you offer is probably what created your boom in business in the first place, so you don’t want to compromise that. to, and then see if that pays for the assistant’s wages. That should help you easily see if it’s worth the investment. If it’s on the border, you may still want to go for it if you have a lot of confidence in the market and your ability to bring in business. If you’re not quite there yet though, it might be a good idea to look into a virtual assistant until your business is ready to expand. better, you need to look at yourself honestly too, constantly evaluating what you can do better. It’s also your job to set up systems and operations, that are constantly refined with the feedback of your team members. Clear and constant communication is key with your clients as well as your team. To find out more about Nancy Gibson, call 847-363-9880, email nancygibson@atproperties.com, or visit atproperties.com/agents/nancygibson www. To learn more about Stephanie Pribble, visit pribblegroup.com or her Facebook page, email pribble@pribblegroup.com or call 713.542.1730 www. To find out more about Kelli Chabot, visit kellisoldit.com, call 816-718-6863 or email her at kellisoldit@kw.com www. CHRISTOPHER CHEESEMAN & JONATHAN FINNERTY “We conduct our business honestly, ethically and passionately, and we work hard to get our clients to the next chapter of their lives,” says Top Agent Christopher Cheeseman, who along with his husband, Jonathan Finnerty, head up The CJ Team at Anchor Real Estate of Long Island, located in Patchogue Village. The couple’s entrée into the real estate world was born out of Christopher’s lack of fulfillment with his former career as Vice President of a manufacturing and event design firm. “Jonathan and I had discussed the idea of working in real estate before, so I suggested we both take a chance and give it a shot.” In 2015, armed with their newlyacquired licenses, the pair hit the ground running and found almost instant success. The CJ team sells primarily in Suffolk County, the eastern half of Long Island, though they will travel anywhere on Long Island their clients request their services. Currently overseeing an equally-dedicated team that includes agents Rachel Henning, Samantha Bertuccio, Thomas De Santis, as well as newest member Timothy Edwards, Jonathan and Christopher have forged a brand that is synonymous with excellence in customer service. This client-centric focus has translated into a business that is almost entirely based on referrals from their satisfied buyers and sellers, an impressive feat in their highly-competitive market. “I think it’s because we treat our clients well, we’re honest, and we forge a connection with them,” says Jonathan, when asked to account for the loyalty their clients demonstrate. “We try to keep the entire experience as stress-free as possible for them.” There are many other factors that come into play, chief among them the pair’s affable and upbeat personalities that instantly put their clients at ease. “Not only are Jonathan and I business partners and husbands, but we’re also best friends. We’ve been told that we’re very funny together, and I think our clients enjoy that,” Christopher proudly shares. Another primary element in The CJ Team’s success story is their thorough and intelligent marketing strategies. Professional photography is utilized exclusively, and a 3D Matterport tour is provided for every luxury property. Professional designers are employed to create all of their sleek marketing materials. A robust internet presence and deft utilization of social media platforms ensure that each of their listings is seen by as many potential buyers as possible, and quick sales for top dollar are more the rule than the exception. When asked what they like most about what they do for a living, Christopher grows thoughtful for a moment before replying. “We like the fact that we are serving a purpose,” he says finally. “We feel like we’re giving back to our community by helping people find a home in a neighborhood they love.” The CJ Team gives back to their community in a wide variety of other ways as well, including their support of a wide array of local charitable organizations, and includes their hosting of annual food, coat and toy drives. Christopher, Jonathan and Rachel also participate in Cycle For The Cause, for which they rode bicycles from Boston to New York to raise money for people living with AIDS. This year CJ Team Member Thomas De Santis will be doing the ride with them as well. When Christopher and Jonathan aren’t working – which, they admit, is rare – they enjoy nothing more than traveling and spending time at their Fire Island Beach house with their two dogs. Christopher and Jonathan’s plans for the future are fairly simple, but in keeping with their philanthropic natures. “In addition to growing our business with our Broker, Gina Ferraro, at Anchor Real Estate of Long Island, we want The CJ Team to be known as the real estate team that gives back to the community. That’s our goal and our mission.” And all the while, of course, continuing to offer the top-notch, caring customer service that has become their stock-in-trade. GENEVIEVE CONCANNON Genevieve Concannon has over a decade of experience in real estate, and while her expertise in working closely with builders and her ability to walk clients through the buying and selling process with confidence have set her apart, what truly makes Genevieve special is her dedication to creating connections. LEE ELMORE Even as she approaches two and a half decades in the real estate business, Top Agent Lee Elmore still retains a marked enthusiasm and passion for helping her clients achieve their real estate goals. Working under the banner of Berkshire Hathaway HomeServices Florida Network Realty in Atlantic Beach, Florida, Lee brings to the table a fierce combination of dedication and industry knowledge that has resulted in her stellar reputation as a trustworthy real estate advocate. While any agent can sing their own praises, the best assessment of their abilities is often found in the reviews they have received. “Lee is a great agent in the Jacksonville area. She was the selling agent when I bought my first property in the area…She is very attentive, knowledgeable and realistic. I highly recommend her,” reads just one of the glowing testimonials Lee has accrued. Prior to her career in real estate, Lee was in the retail field for twenty years, where she honed the excellent customer service skills that continue to benefit her buyers and sellers today. “I owned a clothing store,” she recalls, “and when I closed that business I was looking for a new career path where I could still help people, and stay in a service-related industry. My grandfather was an architect who built many of the historic properties in this area, so I always had a great interest in houses.” A friend suggested that real estate might be a good fit, and Lee decided to give it a try. That was a fortunate decision for the many grateful buyers and sellers who have since been lucky enough to work with her. Lee has fairly simple plans for the future of her business: to continue helping as many people as she can, and to keep on providing the amazing service that has become her stock-in-trade. Additionally, she looks forward to mentoring newer agents entering the industry, and to stay abreast of the ever-changing real estate industry. “There is something new to learn in this business every single day,” she says. FLOULIS SISTERS, LUXURY REALTORS Buoyed by a strong economy and a lack of a foreign buyer tax, Montreal’s luxury real estate market is soaring. And selling this island city’s most exclusive neighborhoods are Magdalini and Androniki Floulis, whose particular view of luxury real estate helps buyers and vendors realize extraordinary dreams. As a team for nearly 15 years, Floulis Luxury Realtors is synonymous with unmatched knowledge and expertise. To learn more about Tanner Hawryluk, visit tannerhawryluk.com or go to his Facebook page, email tannerhawryluk@remax.net or call 780-962-8580 www. DAVE LUPTAK Top Agent Dave Luptak – Lead of Long & Foster Real Estate’s Dave Luptak Team in Annapolis, Maryland – is rapidly approaching a full decade of providing excellent customer service to his many buyers and sellers in Anne Arundel County. With fortythree closed transactions in the last twelve months and over $14.5 million in sales volume in 2018 alone, Dave and his team are justifiably proud of the number of clients they’ve been able to help achieve the American dream of homeownership. Thoughtful, comprehensive marketing strategies have also played a prominent role in Dave’s success story. Professional photography and video are utilized exclusively, as is expert staging for both the interior and exterior of every listing. “We do everything with a keen eye for marketing and online presentation,” says Dave. Dave’s plans for the future include growing his business, continuing to improve his already-exceptional marketing presence, and streamlining current processes to better service their clientele. When he’s not working, which is rare, he admits, Dave enjoys nothing more than spending time with his fouryear-old granddaughter, who he is raising as a single parent. He also loves being outdoors running, paddleboarding and other activities afforded by Annapolis’ water lifestyle options. 8 Break database solicitation down to a call session every working day. 9 Buy a good quality, used vehicle with low mileage. 10 Get up a half-hour earlier and read the Bible. 11 Eat all frogs (distasteful activities) in the first hour of office time. 12 Establish vacation and time off goals. 13 Plan capital improvements to rental properties. 14 Buy guns, ammo, dehydrated food, water, generator or other disaster preparedness items. 15 Create better habits including gym time, walking, running, cardio, weightlifting, less sugar, better food. 16 Determine net worth for comparison with future years. 17 Set friend goals – either increase the number or have deeper relationships. 18 Make a will or better yet, a trust. 19 Refinance into fixed rates. 20 Pay all estimated taxes and keep income taxes current. 21 Institute various plans to increase the “at bats” with sellers. 22 Reduce money on buyer generation and move it to seller generation. 23 Fund retirement accounts. 24 De-clutter using eBay and garage sales. 25 Plan fun activities to look forward to with family. These top twenty-five represent most of the ideas contained within my clients’ goals for 2016. I hope this will give you some ideas in finding your passion. Copyright©, Walter Sanford. All rights reserved. To learn more about Maria Richards email Maria@Maria-Richards.com, visit Maria-Richards.com, or call (760) 902 – 1761 www. who they are, why they’re inspired to buy a home at this juncture in their lives, and how they see their lives unfolding once they become a homeowner (or repeat homeowner). Think of it as a letter of intent. Buyers benefit from taking abstract fears and dreams and articulating them on paper. Likewise, this document can serve as a valuable tool during a bidding war. Letters like these can help sellers with multiple offers make a personal, emotional connection with a particular buyer. Sellers Perspective: Manage expectations. When multiple offers are rolling in on a property, it’s easy for sellers to get carried away. Numbers are flying, expectations are heightened, and sellers may become hypnotized by higher and higher offers and ideal outcomes. While it’s good to celebrate prime market positioning, it’s also important to maintain an even keel so that your seller’s mind is clear and they’re thinking rationally through their options. Sometimes the highest offer isn’t necessarily the sure thing. Manage your clients’ expectations by leading by example, offering a balanced perspective, and talking them through all potential outcomes so that they don’t only hone in on the best-case scenario. During a bidding war, tensions are running high for seller’s too, who will soon begin their next chapter in another home. Keep a cool head and remind your client to see the big picture, recognize that it’s possible for some offers to fall through, and to sit tight until the closing table has been successfully reached. personal touch can make. Some popular approaches to standing out include personal letters—as mentioned above—tailored to the property. Was the property in question a family home for years? You might have clients detail their dreams of raising a family inside those walls, rather than tear the property down and rebuild something to boost the lot’s value. Including a family photo is also a good tact for personalizing letters in a bidding war. Likewise, little gifts included with your offer can speak volumes about your personality and due diligence as an agent. It may seem a little cheesy, but when sellers are looking at ten near-identical offers, those personal touches can really paint a compelling, personalized picture. Seller’s Perspective: How powerful is cash? Data shows that cash offers—typical of investor clientele—double the chances of having an offer accepted. This goes hand in hand with waiving a financing contingency, which also helped boost the probability of an accepted offer, according to research. Cash is king, however, since offers that aren’t completely reliant on comprehensive financing seem to minimize risk for sellers, who are already eager to see a deal go through. Cash deals also tend to go through quickly, freeing sellers up to pursue their next property and move on to new horizons. While not every buyer has the ability to operate in cash, it’s a worthwhile consideration for those in ultra-competitive markets and with liquid capital. While the bidding process can be stressful for agents and clients alike, it’s important to remember that it’s a time of opportunity, too. If you want to make the most of it as a seller, data shows that a personal touch can endear buyers to their seller counterparts. For sellers navigating a competitive process, it’s important to keep a balanced perspective. For agents, here’s the bottom line: get creative, be resourceful, and use all the tools in your arsenal to achieve the best result for the clients you serve. To find out more about Beth Traverso, visit her website at BethTraversoGroup.com, call her at 206.931.4493 or email her at beth@bethtraversogroup.com www. MARK VITTARDI Mark Vittardi holds strong to one central concept as a REALTOR®, and as leader of The Vittardi Real Estate Group: be genuine. “Folks often underestimate the role of a real estate agent.” Mark explains.”As professionals, it’s an honor to assist those who put their faith into us, to provide proper guidance from initial contact, through contract to close. My clients are putting their biggest investment into my hands to execute and bring back the best return. My mantra has always been: be honest and genuine to earn the trust and respect of clients. No one wants to be sold anything, they prefer to be educated in order to make a sound decision,” he continues. “Rather than inflate a situation, it has served me best to be direct and precise. I have been able to achieve my quarterly and annual goals by conducting my business with this approach.” Mark graduated from Ohio Wesleyan University with an eye towards public sector leadership, especially in government. He also had a strong entrepreneurial spirit which led him into the industry which Mark explains, “treats me so well.” Mark served eleven years as a personal bailiff in the judicial system while also maintaining his real estate license for the final six of those years. “As a bailiff I interacted with a variety of people who were experiencing complex situations. That experience helps me as a REALTOR® to be creative and quick when negotiating, problem solving, or simply de-escalating a situation.” In June of 2018 Mark dedicated himself full time to the industry, stepping away from the public sector. Mark and his team of seven serve the Northeast Ohio area. His dedication to being genuine means he has a return and referral rate of an astonishing 92 percent, while having a tremendous sale price to list price ratio of 99%; he maintains said rates by being present in the lives of his clients, staying in touch via mailers, phone calls and by not ending the relationship when the deal is closed. To find out more about Mark Vittardi, visit his website at depiero.com/users/mark-vittardi www.